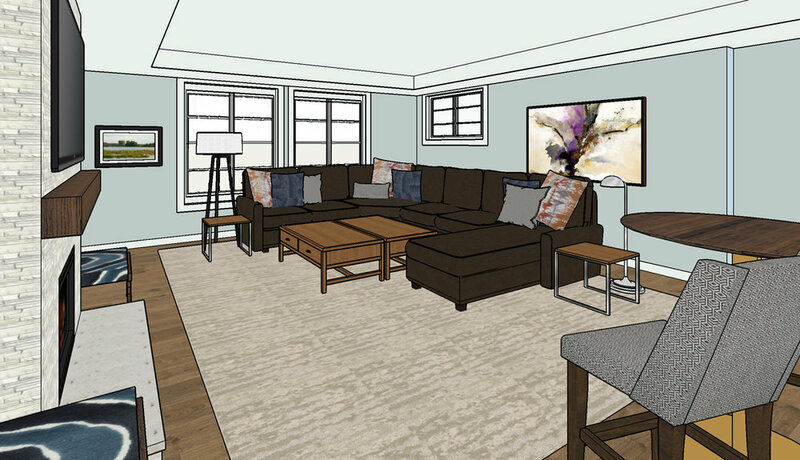 We have been working on a project in Ada, MI that all began with a family of four wanting to convert their existing lower level into an entertainment space. This young family with two children under the age of 2 was looking to transform the lower level of their home into a complete entertaining suite fitted with an immersive home theater and a full bar that could be easily accessed from the main gathering area. After establishing goals for the entertaining space and arranging a walk-through of the existing lower level, we began working from the 1994 home's modern prairie style to model an updated family-friendly entertaining space for our client's review. 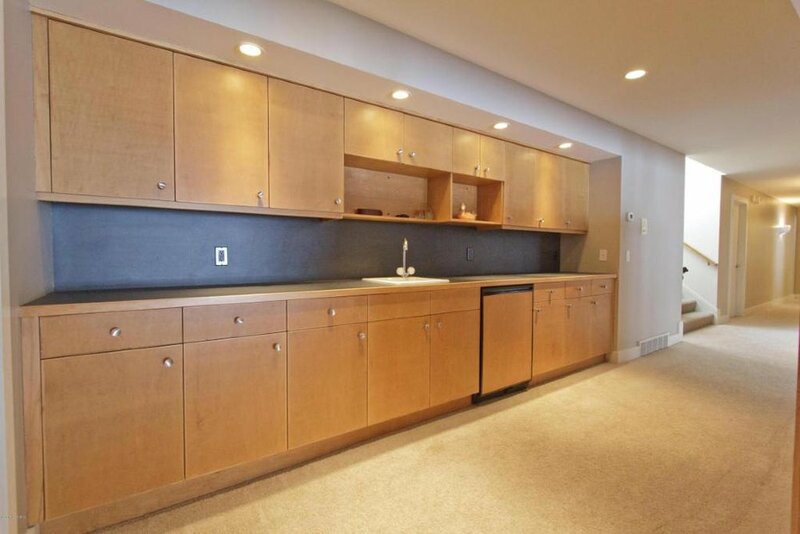 Existing benefits of the home included it's 4,500 square foot land-hugging floor plan, lower level walk-out and windows with mid-century modern horizontal muntins, and its descending open stair with a dark contrasting running bond rail detail. 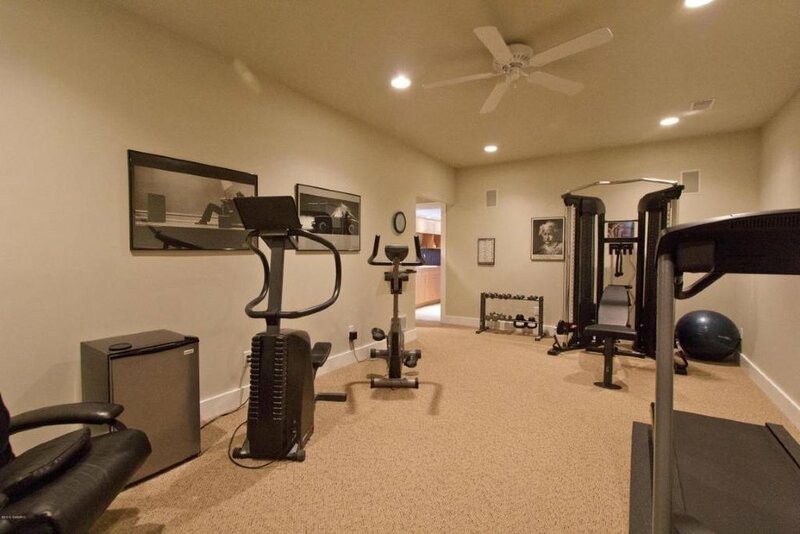 For the home theatre, an existing weight room was a perfect opportunity for the transformation. 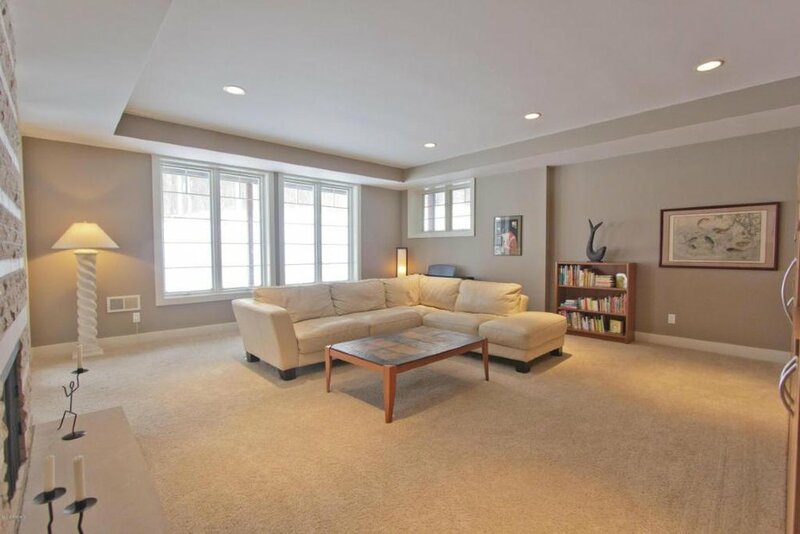 That room in your lower level without windows has so much potential! The existing descent from the main level presented an opportunity to create a welcoming and more dramatic entry experience to the lower level entertaining space. To create a stronger entry statement we recommended a more sculptural vignette with a free-standing furniture piece, larger artwork illuminated by an accenting table lamp and adding definition to the alcove with a contrasting wall-covering as a backdrop. The landing experience serves a more artistic purpose than a utilitarian one as coats, totes, and umbrellas already land at the main entry at the top of the stair. We also designed the entry experience to preserve and capitalize on the available natural light and to improve sight lines of their beautiful wooded lot by removing an old entertainment center that divided the existing wet bar from the living area. That simple modification resulted in a much more open gathering space with easier flow when hosting friends and family. Our direction from the owner for the bar was simply to change out the maple cabinetry for something darker. 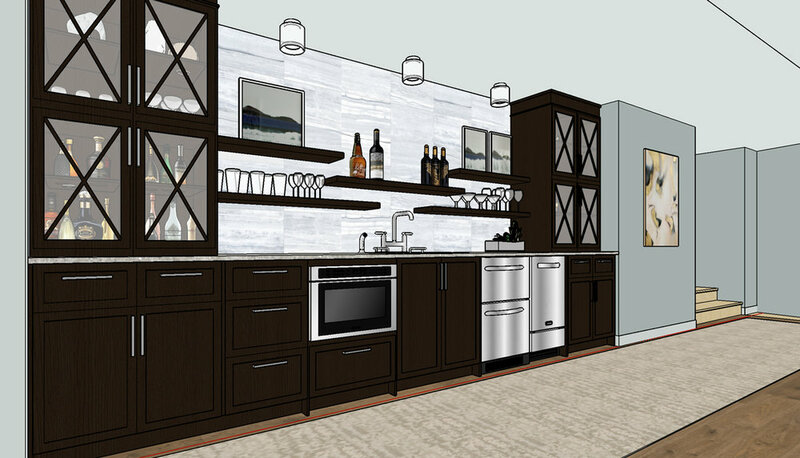 From there, we had freedom to design a full bar that would easily serve guests. Instead of a behind-the-counter service style bar with bar seating, the self-service walk-up bar is a more informal and accessible touch-and-go point with a bar-height table and stools located in the primary gathering space. The self-serve approach keeps traffic moving and simplifies the number of seating areas which keeps guests more closely connected. Beginning with dark wood and the walk-up layout, we amplified the bar statement by extending the upper cabinet height to the ceiling, introduced deep glass-front cabinet doors along with open shelving for both storage needs and a display-like quality, a full high-contrast backsplash, and accent lighting above the countertop to make it all glow. Equipped with undercounter appliances we included a built-in microwave drawer, stacked refrigerator drawers, and an ice maker. 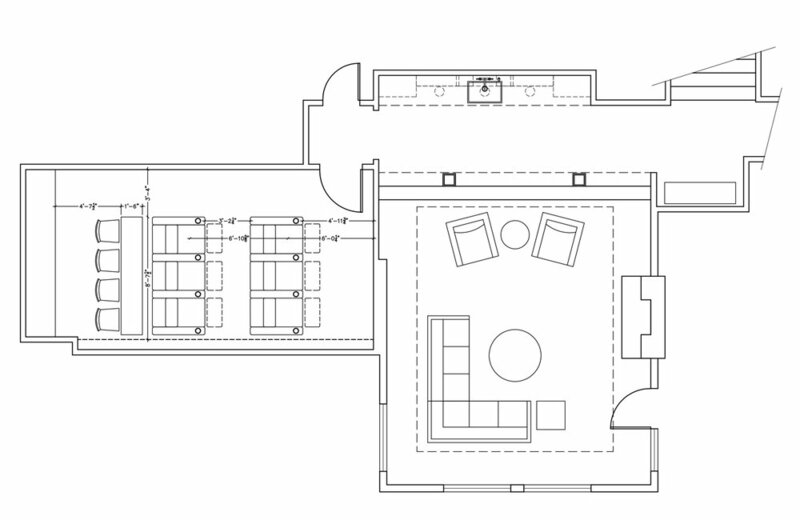 The changes to the main living area are more subtle, but have surprising impact. 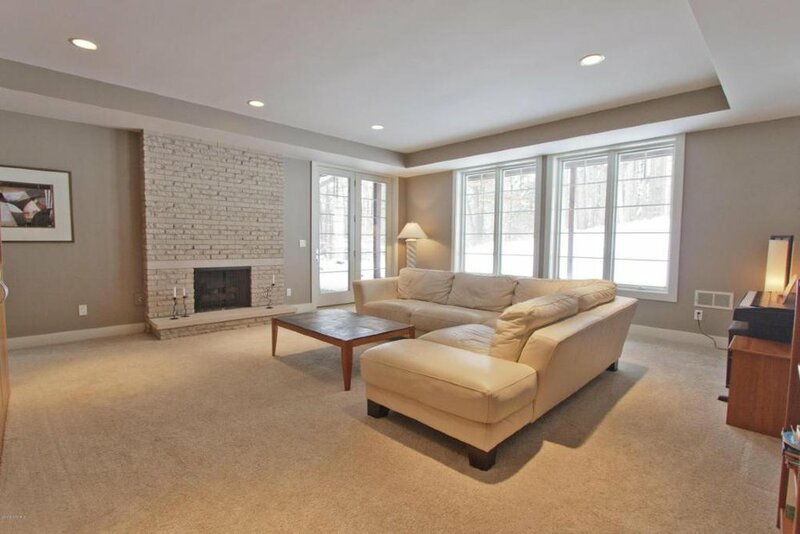 The new sectional arrangement changes the orientation toward the fireplace instead of the existing entertainment center and comfortably seats at least 4-5 people. We moved the TV above the fireplace and added a bar height table and stools where the existing entertainment center was located creating a better transition between the bar and the main gathering space. By changing the arrangement, now someone standing at the bar or stepping out of the theater room can catch all the Superbowl commercials, whereas before, if you were up for a drink you would have no visibility of whatever was playing. Not to mention, because there is more indirect natural light from the north above the fireplace, the new location for the TV also reduces some glare. Our role for the multisensory theater room was to layout a multi-row theater and select recliner seating for 6 and casual bar height seating for 4 with proper clearances. 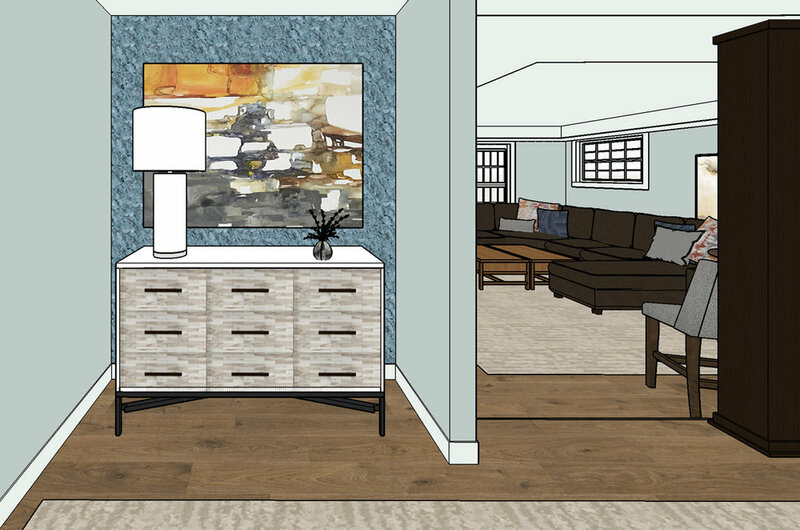 We didn't get too far ahead of ourselves designing this space yet because we need to collaborate with the experts (whom are in the process of being selected) to make sure the theater experience is directly linked to the technology and equipment designed for the space. To create an immersive and ideal cinematic experience, we need to make certain that our seating is optimally sized and located for proper viewing angles and that optimal distances from speakers are maintained based on a professional home theater team's recommendations. As our clients sign contracts with a builder and home-theater professional, we'll be excited to see this transformation unfold! Hope you enjoyed this little sneak preview into a work in progress. 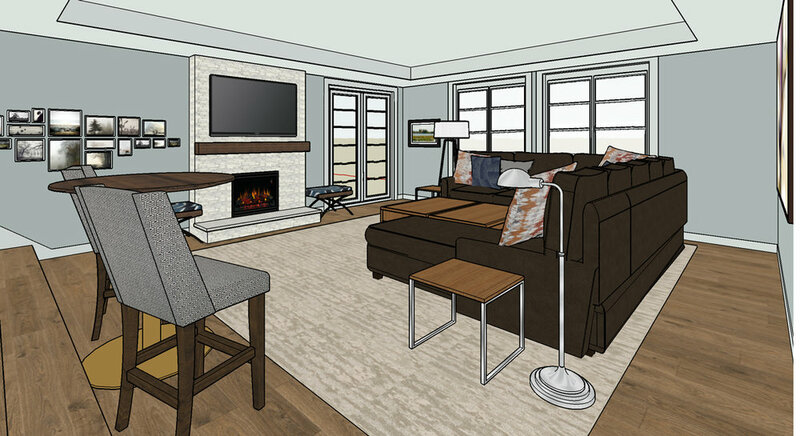 Need some help getting your interior design project going? Hiring a professional like the interior designers at Jennifer Butler Interior Design is a great place to start. We can help bring definition to your ideas for your home, office, business, new construction, renovation or remodel. This frees you to focus on your family, your work, your travel and recreation while our experts take care of the design and implementation. Rest assured that our designers will create interiors that realize your vision for spaces that meet your luxury lifestyle and 21st century work style needs and visually reflect your unique design style. Sign up for more inspiration from our Designer Journal.